Most any honest person can own up to harboring at least one fast-food guilty pleasure. In Drive-Thru Dreams, Adam Chandler explores the inseparable link between fast food and American life for the past century. The dark underbelly of the industry’s largest players has long been scrutinized and gutted, characterized as impersonal, greedy, corporate, and worse. But, in unexpected ways, fast food is also deeply personal and emblematic of a larger than life image of America. With wit and nuance, Chandler reveals the complexities of this industry through heartfelt anecdotes and fascinating trivia as well as interviews with fans, executives, and workers. He traces the industry from its roots in Wichita, where White Castle became the first fast food chain in 1921 and successfully branded the hamburger as the official all-American meal, to a teenager's 2017 plea for a year’s supply of Wendy’s chicken nuggets, which united the internet to generate the most viral tweet of all time. Drive-Thru Dreams by Adam Chandler tells an intimate and contemporary story of America—its humble beginning, its innovations and failures, its international charisma, and its regional identities—through its beloved roadside fare. "Before anyone casts judgment upon fast food, Chandler asks readers to take a much closer look at all the outcomes and influences of this industry, how these businesses both provide employment and act as equalizing venues of social interaction.... In Chandler’s version of the narrative, these corporate behemoths are still made up of people. He shares a host of anecdotes about some ever-fascinating individuals, from servers to CEO’s." "This book will completely change the way even the fiercest health advocate thinks about our nutritional landscape. There is no road to reform without understanding the ways fast food is woven into American history and culture, which Adam Chandler articulates brilliantly." "Driven by relentless curiosity, a sharp mind, and an honest affection for America’s fast food, Drive-Thru Dreams splits the difference between structural analysis and charming storytelling, and makes a compelling case that to understand fast food is to understand America. Whether chronicling the industry’s birth among rags-to-riches pioneers or tracing the startling symbiosis between social media and fast food sales, Chandler brings our understanding of fast food into the twenty-first century." 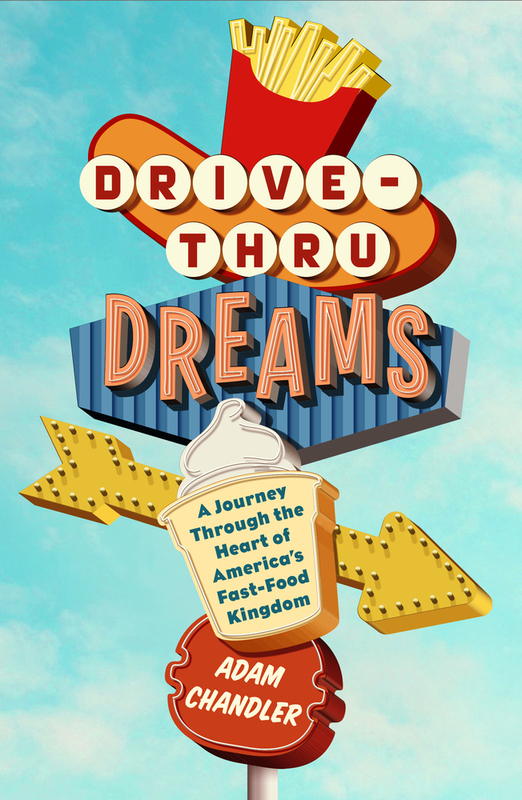 "Drive-Thru Dreams is a key text to understanding the American love affair with fast food and the culture around it, including its economic impact and fandoms. This spicy and humorous narrative feels personal while writing the necessary chapter of what may be, for good or ill, some of America's most consumed chow. Brilliant and necessary." "On the page, terrific writers know how to have their cake (or their Big Mac) and eat it, too. Adam Chandler is such a writer, and Drive-Thru Dreams, his account of the wild and inalienable wonderland of American fast food, gives us not just insight and history but a pleasure that is downright gustatory." "Adam Chandler puts the country on a griddle with his juicy defense of that much-maligned national obsession, fast food. It’s a delicious full-item, be-pickled feast of high calorie Americana—including dad jokes. Whatabook! I’m hungry!" ADAM CHANDLER is a writer based in Brooklyn. A former staff writer at The Atlantic, his work has appeared in The New York Times, The Wall Street Journal, The Washington Post, Texas Monthly, New York Magazine, Slate, Esquire, and elsewhere. Drive-Thru Dreams is his debut book.